Last week I mentioned in passing Nancy Kress’s Dynamic Characters. Toward the end of that book, she has a chapter on theme, which she renames “worldview” to avoid the cringe that most of us experience in recalling elementary- through high-school literature classes and all the themes we had not then lived long enough to recognize, never mind understand. The chapter got me thinking: how would I, as an adult, define theme in reference to a novel? Does a novel even need a theme? Many writers insist that their works neither have nor require a theme, and that it’s up to readers to decide what meaning a book has for them. Others, including myself, disagree. A theme, as I show below, acts as a kind of organizing principle, imparting emotional coherence to a work of fiction. It keeps plot and character focused on the essentials. Now I would be the first to admit that I pay little attention to theme in the initial stages of writing. First off, only some stories present themselves to me in sufficient detail early on for me to perceive the underlying theme. Even the few that do I don’t entirely trust: they are likely to morph midway through, revealing a theme I had not anticipated. But once that first draft is done, I agree with Kress that a theme helps pull a story together. As John Truby notes in The Anatomy of Story—another on my top five list of must-have writing craft books—it’s a mistake to regard characters as existing in isolation. Instead they embody differing attitudes and responses to the novel’s central theme. The plot offers them a chance to express and develop those responses. So what is a theme? Is it really the same as a worldview? Webster’s 11th Collegiate Dictionary defines it as “a subject or topic of discourse or artistic representation,” which doesn’t clarify much. Truby equates it with the writer’s moral vision, which does correspond with a worldview in part yet seems to offer a more exact definition. But I think the concept is much simpler than that. In brief, the theme is what the book is really about. 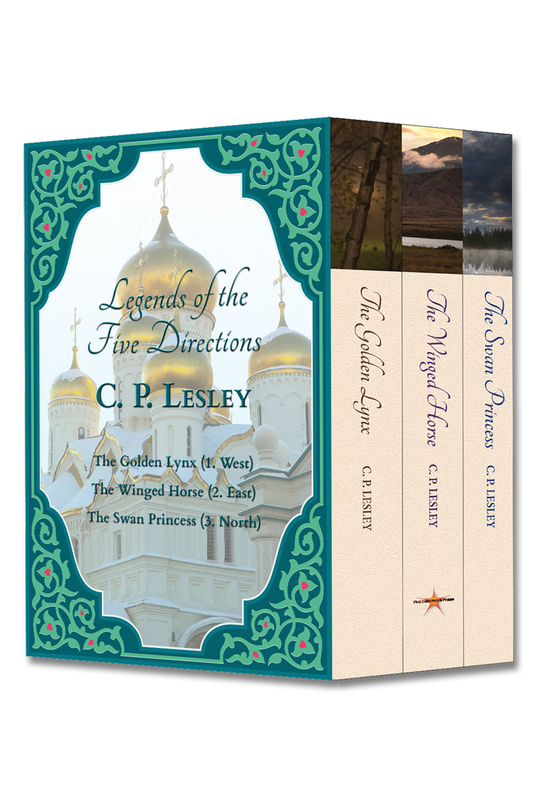 Take my Legends novels as examples. The theme in The Golden Lynx is vengeance: what do you do when someone close to you, an innocent, is murdered? One approach adopted by the characters leads them to kill in return, out of a desire for revenge or justice. A second has them take refuge in religion. A third pushes them to investigate what went wrong, including whether the innocent was in fact as guiltless as the family believed. A fourth redefines vengeance as preventing a different crime, and so on. The varying fates of those embracing this or that approach express my moral vision about revenge and what it can and cannot do for people. In The Winged Horse, the story—the theme—revolves around the competing claims of loyalty: to oneself, to others, to a principle or a cause. The Swan Princess explores integrity, in this case from the perspective of a young woman who has gone too far in the direction of pleasing others and needs to recover, then incorporate, her own sense of herself without swinging from one extreme to the other. The Vermilion Bird, almost finished but not yet published, focuses on family through a group of characters who in some cases adore their families (who may not always deserve their love) and in others can barely bring themselves to speak to their family members (who do not necessarily deserve their dislike, although they have certainly done things to provoke it). Book 5, The Shattered Drum, is one of the rare novels to have already revealed its basic structure—probably because it ends the series, meaning it has a lot of loose ends to tie up. But I am less than twenty pages into it, so while I have a hint of what the theme may be, I know better than to reveal it yet. You have no doubt noticed that these themes are interconnected. The desire for vengeance arises in part from loyalty to the person hurt, which in turn often comes from that person being a close friend or family member. Loyalty can inhibit the development of a separate identity and thus of integrity, which is above all the decision to respect and value one’s private self. Families certainly impose demands and expectations on their members, behaving and expressing emotions in ways specific to the culture in which they live but also to themselves. These demands necessarily fit some personalities better than others, and that in turn feeds questions of identity and integrity: How does a person like Maria, heroine of The Vermilion Bird, cope inside a structure that ruthlessly suppresses her gifts and imposes tasks on her in which she has no interest? How does she respond when a different family makes different assumptions that, however welcome, force her to change her fundamental beliefs about who she can and should become? The Shattered Drum, too, incorporates elements of these themes. Which one dominates in the end will have more to do with emphasis than exclusivity. As writers we constantly revisit our own story, from different angles and with varying perspectives. The appeal to readers depends on the extent to which our problems reflect their own—or, more grandly, basic human themes. Put that way, the concept of theme seems not so difficult to grasp. When we sit down to write a book, especially a novel, we may not have a particular theme in mind. Perhaps it’s even better not to have one. Then we can give our imagination free rein in the beginning rather than force it into a box. But for sure, our subconscious minds have a theme, and by the end of the first draft it will become obvious. At that point, the writer’s job becomes exploring the theme from as many angles and viewpoints as possible. Because if you have nothing to say, why write a book in the first place? 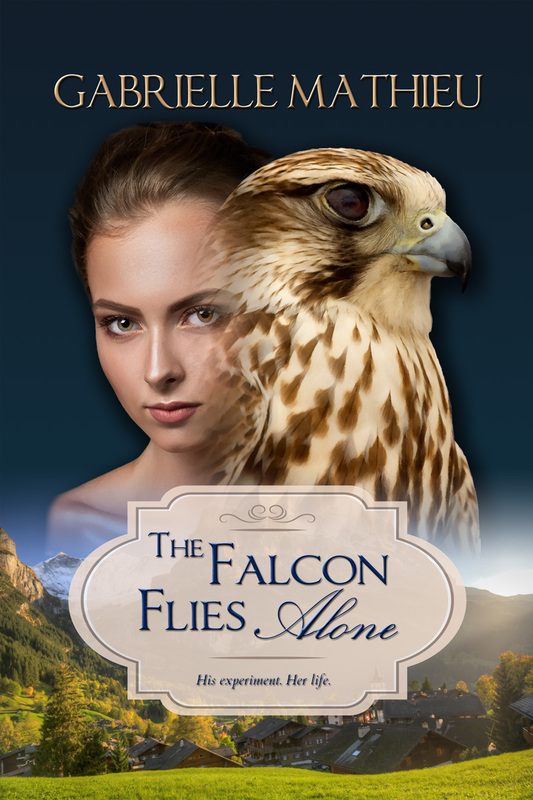 Early in my interview with Gabrielle Mathieu for New Books in Historical Fiction, I ask her about the tag line for the first book in her Falcon trilogy, The Falcon Flies Alone: “We all have a beast locked within us, but in Peppa’s case it’s more than a figure of speech.” We talked about anger and self-assertion, especially in women, and how they are often socially suppressed or, if not suppressed, evaluated differently from the same behavior in men. Gabrielle notes that she is not as blunt in her anger as her heroine, Peppa, but instead tends to avoid conflict. I could relate, as I have the same issue with several of my heroines. Later in the interview, Gabrielle mentions that what distinguishes her antagonists from her protagonists is that the former use “some very blunt instruments” to attain their goals. These two comments got me thinking about how fiction is, in some respects, a way of exploring emotional paths not taken—for readers as well as for authors. In novels we can explore vengeance and murder, crises and conflict. We can talk back if we’re shy, beat our opponents up if we are timid or physically weak, flirt with infidelity or fall madly in love with characters who will never leave their socks on the floor or forget to pick us up at the airport. We can release the beast within—investigate it, test it, revel in it—without hurting ourselves or anyone else. The same point applies to other art forms, of course: movies and television, especially. But well-crafted, well-written novels and short stories dump us inside another person’s head in ways that real life cannot, that even video cannot. We can see the world through the eyes of a falcon, a bad guy, an abandoned teenager, a runaway bride. We can experience life at the extremes, as most of us would much rather not do in real time. As Nancy Kress puts it in her wonderful Dynamic Characters, “In our lives we want tranquillity; in our fiction we want an unholy mess, preferably getting unholier page by page” (159). And Peppa surely does get herself in an unholy mess, which gets unholier not only page by page but book by book. That’s why her story grabs us and doesn’t let go. But don’t take it from me: listen to the interview, then buy the book. 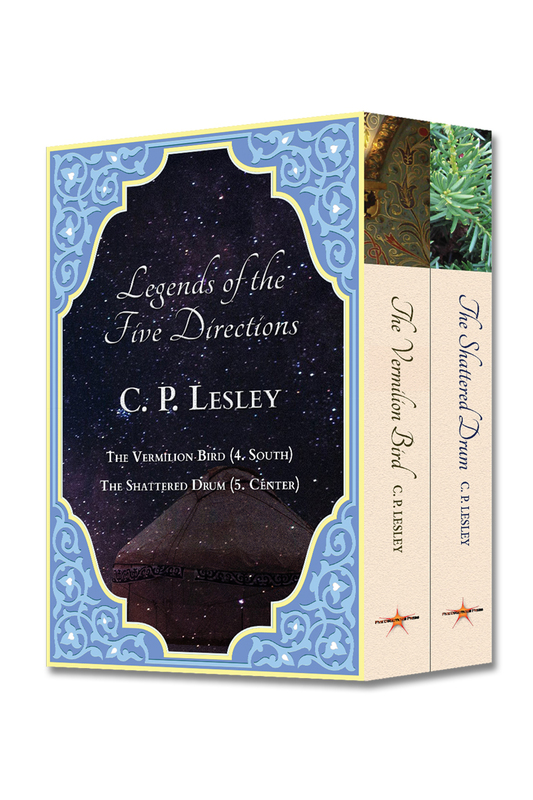 You can also hear (and in the case of The Falcon Flies Alone, read) an excerpt from the first two books at their respective pages on the Five Directions Press site: The Falcon Flies Alone and The Falcon Strikes. 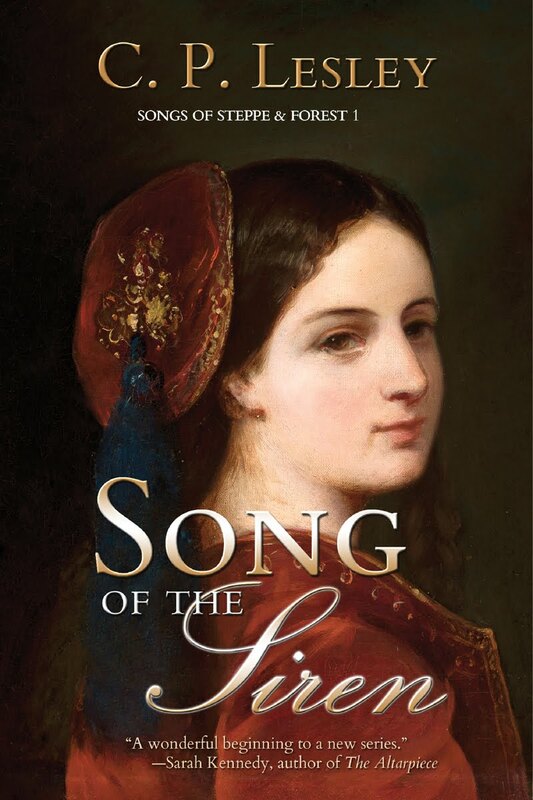 As ever, the rest of this post comes from New Books in Historical Fiction (and is cross-posted to New Books in Fantasy and Adventure). Peppa Mueller has a lot going for her. The daughter of a deceased Harvard professor who gave her an eclectic upbringing, she is heir to his fortune, and Radcliffe has accepted her application for undergraduate study in chemistry—her gift and her passion. Too bad that her conventional Swiss relatives cannot imagine why any young lady would want a college education in 1957. Sick of their constraints, she runs away from their home in Basel, even though she cannot collect her inheritance for another two weeks. A house-sitting job draws her to a remote Alpine town, where she becomes the subject of a terrible experiment. Wanted for murder, accused of insanity, and beset by visions of herself as a fierce peregrine falcon, Peppa decides to go after Ludwig Unruh, the man who has victimized her and now holds her precious German Shepherd hostage to force Peppa to participate in his ongoing research into psychedelic plants. But Unruh has far more experience with both chemistry and life than Peppa does, not to mention far fewer scruples. And as time goes on, she discovers that her past and his are inextricably intertwined. She wants to stop him, she wants to get herself and her dog out of his hands, but to do either, she must first survive his experiment. In The Falcon Flies Alone Gabrielle Mathieu, the host of New Books in Fantasy and Adventure, creates a compelling, fast-moving novel that straddles the line between reality and the world of the imagination. Few things are more satisfying to a writer or publisher than seeing a manuscript you’ve worked on for months or years appear in print. E-publication has its merits, and tablets and e-readers handle novels, which tend to have few images and simple formatting, with particular aplomb. Even so, it’s not like holding an actual book in your hands: admiring the cover, turning the pages, noticing the small details that say, yes, this is a published book. So it’s always a special joy to announce a new work by one of our Five Directions Press authors. 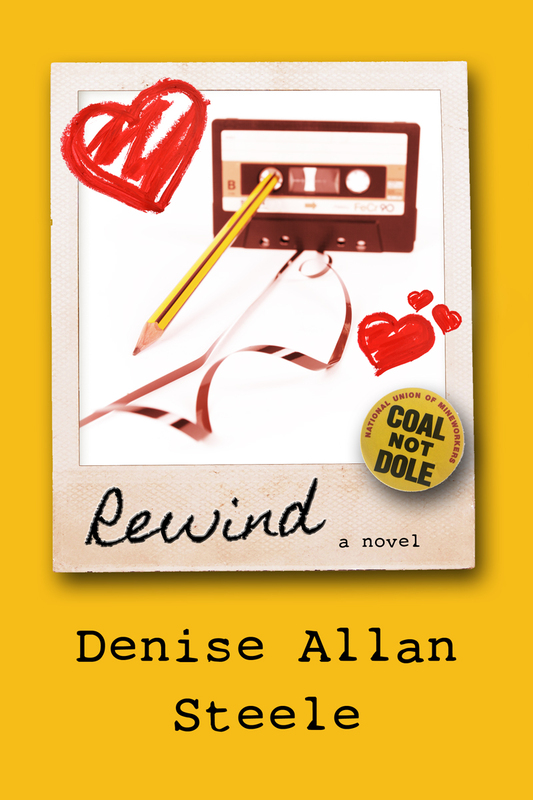 This month we focus on Denise Allan Steele’s new novel, Rewind, formally launched just yesterday. It’s charming, touching, hilarious—everything a novel should be. Denise says she wrote the book because her kids begged for stories of the “olden days” (i.e., the 1970s) when she was a teenager in Scotland. 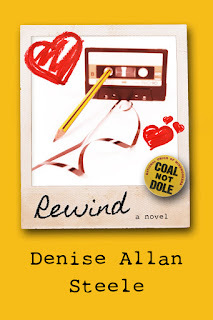 The novel follows the adventures of Karen Anderson and her best friend, Carol, as they survive secondary school, attend college and nursing school, marry and have children, work in their chosen professions, move to different continents, and ultimately reunite at the funeral of Carol’s ninety-year-old Grandpa Jimmy, setting off the second half of the story. Carol and I sat huddled together on the cold hard pew of Kilbrannan Parish Church. The weak sunshine coming through the huge stained glass window above our heads illuminated the figure of Saint Andrew, the ruby red of his gown beautiful and rich against the sapphire blue of the Scottish flag behind him. I had always loved that window, the way it gave me a feeling of peace and God and benevolence and contentment, the colours precious and magnificent in the austerity of the chilly old Presbyterian church. I had last seen the window from the inside in May 1977, when I had just turned fifteen. That was the day that Carol and I had been thrown out of the Girl Guides for refusing to say out loud the Brownie Guide promise that we would serve our God and our Queen. We felt that the Queen had enough servants and we definitely didn’t want to serve God, so we were asked to leave. We didn’t tell our mums and every Friday evening for months we had put on our Guide uniforms and gone to the amusement arcade at the beach, got changed in the toilets and hung about at the slot machines looking at boys and buying candy floss with our Guide money. Our sham was over when Mrs. Howie, the Guide leader, met Carol’s mum at the bus stop and our mums made us go the next Guide meeting and apologise. 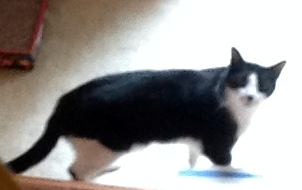 I hadn’t seen her since the last time I was home a year ago, and it felt like we had been together last week. Every time I came back to Kilbrannan, even after twenty-five years, it felt like I had been gone for a few days, and Carol and I just slotted back in to our lifelong friendship. Now, don’t you want to read more? You can find the book at Amazon.com or get more information at our Five Directions Press site. The book already has thousands of likes on Facebook, so don’t miss your chance to rewind the tape of Karen’s life—and your own. Incredible as it may seem—it certainly seems so to me!—this month marks the fifth anniversary of this blog. If you had told me, in June 2012, that I would succeed in finding things to say every single week for five years, I would have wondered what mind-altering substance you had consumed. Yet here I am, five years on, occasionally frantic in my search for suitable topics for discussion but generally posting on time. This month also marks the fifth anniversary of Five Directions Press. 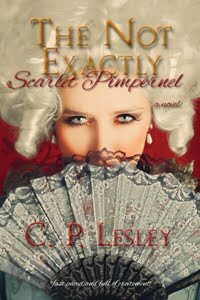 On June 3, 2012, we published the first version of The Not Exactly Scarlet Pimpernel (since reissued in a smaller size with a much spiffier cover designed by Courtney J. Hall). At the time, we saw our coop press as something of an experiment—a lark, even, like those old Mickey Rooney/Judy Garland films about putting on a show. We had only the vaguest idea of what we were doing, but the climate seemed right for a cooperative enterprise that lay somewhere between completely self-published and the commercial format monopolized by large corporate conglomerates. We gave it a try, not knowing what to expect, and it’s been great. That first title has become twenty, out or due by early next year, as well as several more approaching completion but not yet ready to add to the website. (For those counting, Cover no. 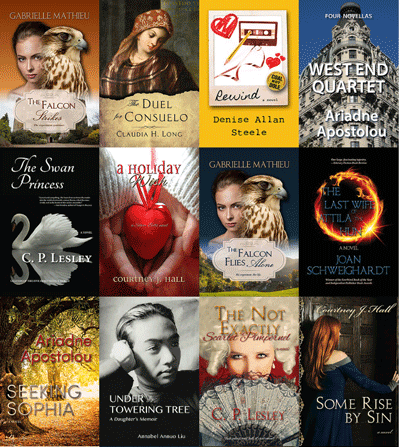 20 is awaiting its big reveal next month before appearing on our Books page.) The latest went up on Amazon within the last twenty-four hours: stay tuned for that announcement next week. Our small group of three has tripled, and most of us have more than one book under our belts. Marketing is still a challenge, but we have learned lots about book production, publication, website design, newsletters and press releases, social media, even promotion. Two of us host podcasts on the New Books Network. And the topics of our books range from the dissolution of the Roman Empire to twenty-fourth-century ballet, with many highways and byways in between, and cover the globe from the secret Jewish communities of Inquisition-era Mexico to psychedelic experimentation in 1950s Switzerland. Last but not least, June marks the ninth anniversary of the writers’ group that gave rise to Five Directions Press and produced most of its early titles. Each year at this time we go out to lunch, forget about the critiques, invite friends and fellow writers, and celebrate. That lunch is this weekend. So a short post today to say that we’re enjoying the journey and to extend our thanks to our authors (who are also our staff), our indulgent families, and especially our readers. Let’s hope this is the first of many five-year anniversaries for Five Directions Press and its writers! Although The Vermilion Bird is far from done, I have a complete story and am working on my fourth draft. A friend is checking the text for historical errors—or will be when she has the time. 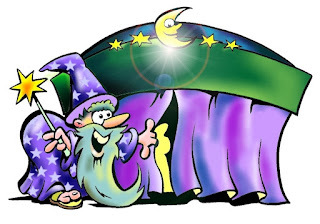 As I feed chapters to my writing group and receive comments, I make adjustments, of course, but since they too have busy lives and writing of their own, it will be three to four months before they can get to the end. So I decided, this past week, to use the down time to think about the next—and last—Legends novel. Usually when I start a new project, it takes a good six months of back and forth before I make serious progress: planning, writing, research, rewriting, sharing, more rewriting, fill in the blanks research, character development, new writing, and so on. This in-between time seems the perfect opportunity to start planning a structure, identifying potential story elements, settling on major characters, defining their goals and motivations as well as the obstacles in their path—all the stuff that goes before actual writing begins. I’m not ready yet to shift my focus from the hero and heroine of Vermilion Bird, and without that, actual writing would be wooden at best. But I am ready to start imagining how the next, or in this case familiar, hero and heroine must struggle to reach a new set of goals. Being a pantser by nature, as noted previously, I don’t get any closer to a detailed plot than a list of things I’d like to see happen. That changes as soon as I sit down to write. Still, having a sense of where I’m going is helpful, even if my characters do tend to take on lives and wills of their own. I love the surprises they deal out when I’m least expecting them. And having a sense of who those characters are at a given moment, even in a series that has already been underway for nine years, is a definite must—although that, too, evolves over time. Here, in Legends 5, I find the list of story elements relatively easy to construct. A series can’t just stop, after all; it must tie up the major developments of the earlier books, adding a sense of general closure to the resolution every story needs even as it establishes a clear direction—beginning, middle, and end—of its own. But I also find myself reluctant to say goodbye to these fictional people who, by the time I finish The Shattered Drum, will have enriched my life for over a decade. Can I bear to let them go? Will the new series slowly coalescing at the back of my brain, which follows into the 1540s and beyond certain characters who never received their due because the world isn’t quite ready for 1,500-page novels, make up for having to reduce my favorites to cameos and walk-ons? I don’t know. In a sense, I’m not sure I want to find out. But that sad day remains a year or two away. For the moment, I’m looking forward to putting my fictional family through its paces one more time. I hope that one day, when I reach the end of that road, you’ll enjoy the results. 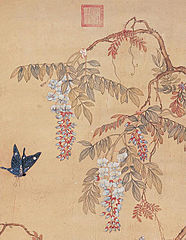 Images: Nomadic Girl, screen capture from Myn Bala; Butterfly and Chinese Wisteria Flowers, public domain via Wikimedia Commons.